DisplayFusion's Monitor Fading allows you to focus on the task at hand, by automatically dimming unused monitors and application windows. 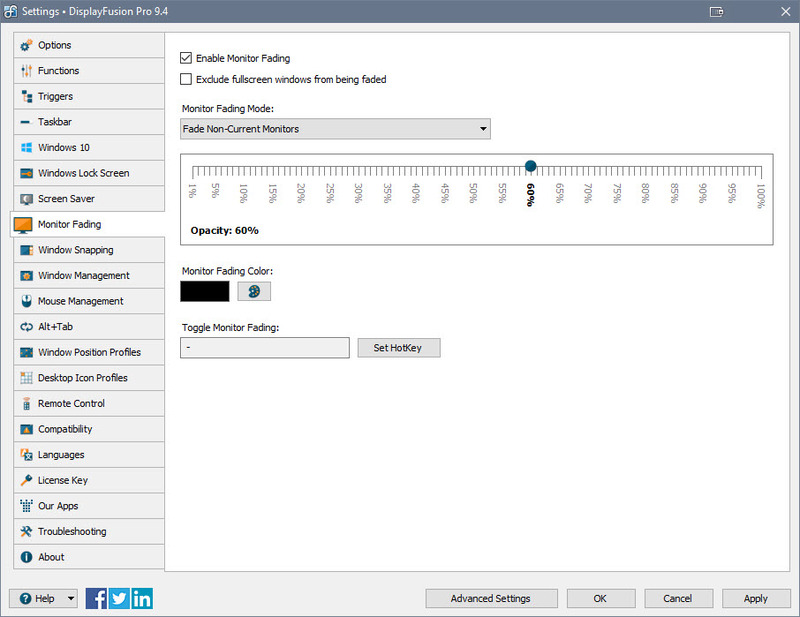 The Monitor Fading feature can be customized for different behaviours (Fade Non-Current Monitors, Fade Non-Primary Monitors, and more). You can also choose the opacity level of the fade from 1% (completely light) to 100% (completely dark), as well as the colour of the fade. The "Toggle Monitor Fading" key combination (Ctrl + Alt + F by default) allows you to quickly enable or disable the Monitor Fading feature when needed. All of these Monitor Fading options can be configured in the DisplayFusion Settings window, seen in the screenshots section below.